Double duty never looked this good. A mirror is almost always just that: a reflective object with a point of functionality that rarely extends past its face value. But for those of us who are looking to the staple with a design-forward lens—think mirrors that can double as art—we often find ourselves having to choose between form and function. Small-space dwellers may be all too familiar with this scenario, and unfortunately, a compromise between the two becomes all too commonplace. 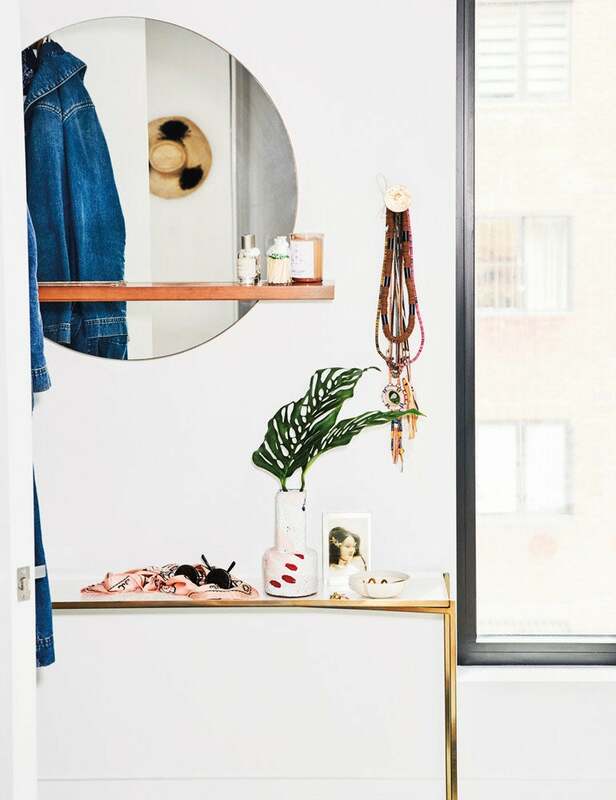 When working within the confines of limited square footage, every inch of floor and wall space counts—hence why splurging on a mirror that’s purely decorative is probably a bit unwise. With that in mind, we scoured the market for the mirrors that combine form and function with effortless ease. These finds are conducive to organization yet bear a style-focused element that can result in an artful finish. Ahead are the storage-optimized mirrors that do it best. Part mirror, part hanger, this standing piece is the kind of versatile storage solution we need in our lives. Its expandable sides allow you to open and close the piece as you please, with ample room for hanging your outfits of the day. A true statement piece if we’ve ever seen one, this mirror-meets-valet is an all-encompassing unit that manages to incorporate essentially every functional element of an entryway. Make ample use of otherwise wasted corner space with this creative combo that boasts a distinctive form of two polished steel plates, which meet atop a lacquered ashtray. Mirror, nightstand… the lines are pretty blurred with this statement-worthy option that makes for the ultimate display for florals and accent pieces. A mirror with a built-in towel rack and hanging rod is the type of multifunctional decor essential every small-space dweller should invest in—especially if you’re lacking sufficient storage in the bathroom. With its cheery yellow finish and convenient built-in hooks, this streamlined piece is the decorative essential every tiny entry deserves. For the mirror that is to be confined to a desktop, consider one with a handy storage solution for jewelry and various other trinkets. Available in two chic colorways, this streamlined version was made with the minimalists in mind. This streamlined floor mirror emulates the simplicity of Scandinavian design with its dual storage trays that play to the structure’s understated finish. Whether set up in the bathroom or the entry, this mirror-shelf combo doubles as quite the effective catchall.